Lance Corporal John Hutton survived just over a year in the fighting line, engaged in some of the most ferocious battles of WWI. He was born in Datchet in 1885, one of at least seven children born to Joseph and Julia Hutton who moved from Colnbrook to Datchet in the early 1880s. His father worked as a stockman and later as a milk carrier on farms. John’s mother died in 1895 in her early forties, when John was 10 years old and his young brother George was just two. His father died towards the end of 1906, age 56, when John was about 21. After their father’s death, John and George moved in with their older sister Elizabeth and her husband David Lewin at Clem Cottage which was set back off Horton Road. A few years later they all moved to 10 Ditton Road (now 30 Ditton Road). In the early 1900s, John had been working as an assistant on an oil van, delivering oil, but by 1911 he had a job with the Thames Conservancy as a labourer, hand-dredging the waterways. George worked for the chemist as an errand boy, delivering medicines. After the outbreak of war, George joined the Somerset Light Infantry while John enlisted in Reading (date unknown) and was sent France in October 1915 as Private 18806 (some records list him incorrectly as Private 18866) in the 8th (Service) Battalion of the Royal Berkshire Regiment. The 8th was a Kitchener Battalion formed in Reading in September 1914 and attached as Army Troops to the 26th Division. The newly-formed Battalion underwent training on Salisbury Plain and returned to billets in Reading in November 1914. They moved to Sutton Veny Camp in May 1915 and proceeded to France on 8 August 1915, landing at Le Havre to join the 1st Brigade of the 1st Division which had suffered heavy casualties in the first year of the war. The 1st Division remained on the Western Front throughout the war. As part of this Division, the 8th Royal Berkshires served in France and Flanders, taking part in many major battles, including Loos in late 1915, the Somme in 1916 and Ypres in 1917. “The 8th spent the first four months of 1916 in the area of Noeux-les-Mines, Lillers and Allouagne. They returned to action on 2 May when a strong fighting patrol attacked a German position known as the Double Crassier. Their next major action was on the Somme on 14 July 1916 when they attacked the two woods at Bazentin. This was followed up by an attack on Mametz Wood on 18 August and at High Wood on 3 September. They were withdrawn from the line on 2 October and spent the winter and spring in and out of trenches in the Albert area spending Christmas in billets at Albert. With more than a year’s experience at the Front, John was appointed Lance Corporal. His Soldiers’ Effects records indicate that this was an unpaid position. It was effectively a trial period to see if he was suited to being a non-commissioned officer. 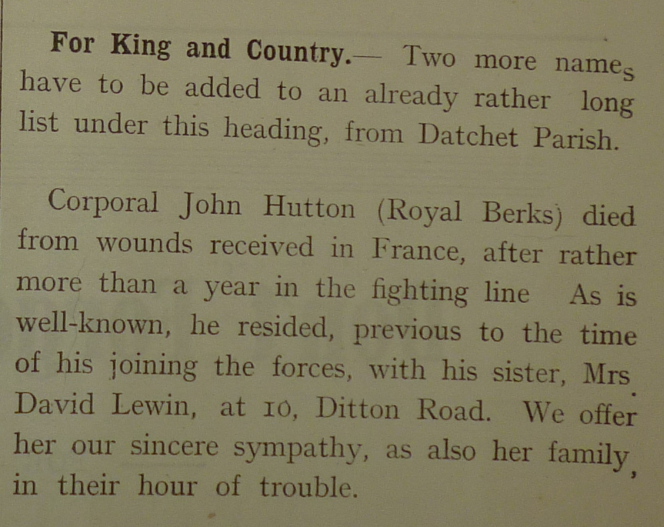 In February 1917 John Hutton was wounded and died. On 17 March 1917, the Windsor & Eton Express reported that John, age 33, had died from his wounds on 20 February 1917. 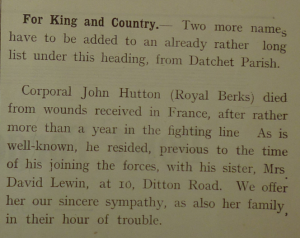 In April 1917, Datchet Parish Magazine also announced John’s death, left. 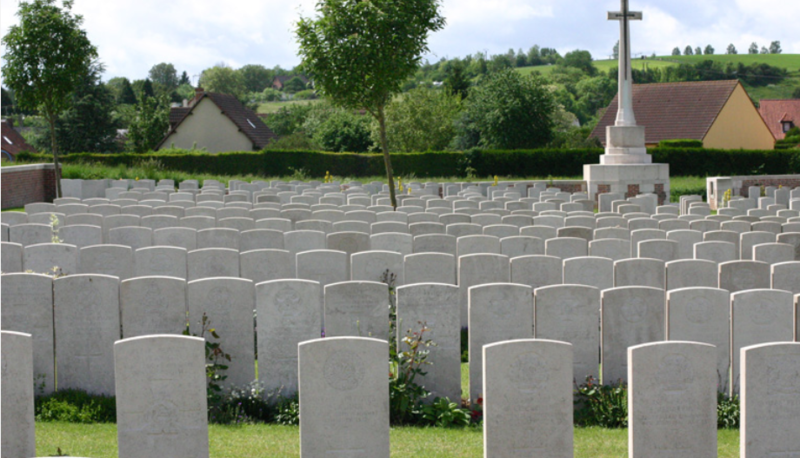 Bray Military Cemetery now contains 874 Commonwealth burials of the First World War, 127 of which are unidentified. John Hutton was awarded the British War and Victory Medals and 1914-15 Star. He was one of four Datchet men (along with Brakspear, Groves and Wilkins) who were in the 8th Royal Berkshires and who are remembered on the war memorial.